Look at the area of severe weather risk from yesterday. Areas from south central Mass to northeast Pennsylvania are just COATED in blue dots, showing reports of damaging winds. Tons of reports from "downstate" New York and Connecticut. Given the amount of tornado warnings the Northeast had yesterday, I'm surprised only one tornado came out of it. They should give "tornado warning" its original definition again: that a tornado has been spotted. Currently, it's not much different from a tornado watch. Agreed. It'd also help reduce the "boy who cried wolf" effect. The NWS has taken notice of this in the last few years. They have stated that they're trying to limit the area covered by a tornado warning as much as possible to prevent false alarms, for one thing. There may be some further changes to protocol coming soon. I've also seen that NWS issues some "Particularly Dangerous Situation" tornado warnings when a destructive tornado is confirmed on the ground and is in or on its way toward populated areas. It seems to me they need to have more degrees of warnings where there are differences that can be easily understood by the public. Best I can tell, tornado warning for "storm capable of producing a tornado" is called the same thing as for one which has a "radar indicated tornado" and for one which is producing a tornado confirmed by a spotter. Looks like the NWS updated the storm report to 3 tornadoes. Particularly Dangerous Situation is a status given to a Tornado Watch, not a warning. It's for a Tornado Watch where long-lived, strong and violent tornadoes are possible. Think of it as the technical definition of "Jim Cantore is headed our way"
Tornado Emergency is a status given to a Tornado Warning where it is confirmed that a strong tornado is on the ground. Actually, there are PDS Tornado Warnings, which act as the second highest level of tornado warning, right below the tornado emergency. PDS warnings are issued when there is a confirmed tornado on the ground with a considerable damage threat. Tornado emergencies are the highest level, reserved for when confirmed dangerous tornadoes hit densely populated areas and are expected to cause catastrophic damage and/or many fatalities. I've never seen a PDS warning, only a PDS Watch. The March 2012 Southern Indiana tornado outbreak came with a PDS watch and a Tornado Emergency Warning. I mentioned this in another thread but the "original definition", as you call it, was never fully done away with. Rather, they added the "radar indicated" option, as the new technology of radar can detect debris in the air after a tornado has occurred. This is particularly helpful at night when tornadoes are difficult to visually spot, or in situations where a tornado may be rain wrapped. To address another point in this thread, as noted, "Particularly Dangerous Situation" tornado warnings ARE indeed issued by NWS offices. This is done for tornadoes that are doing significant damage, but the situation does not rise to the levels warranting a Tornado Emergency, which is still an accepted type of enhanced warning. The bottom line: ANY tornado can be life threatening -- so the distinction between a PDS, a Tornado Emergency, and a "normal" tornado warning should be irrelevant to your safety -- seek shelter immediately for any tornado warning. Here is a prime example of a situation where such technology helps identify a tornado. This particular storm was in Pickens County, Alabama on February 2, 2016 and had a PDS Tornado Warning issued for it two minutes prior to the time I snapped this photo. The top right panel shows correlation coefficient, which measures how similarly both the horizontal and vertical radar pulses are behaving. The area of blue in the middle of all that yellow indicates negative values, meaning something other than rain is being seen -- which in this case was a non-meteorological (i.e. debris) target. 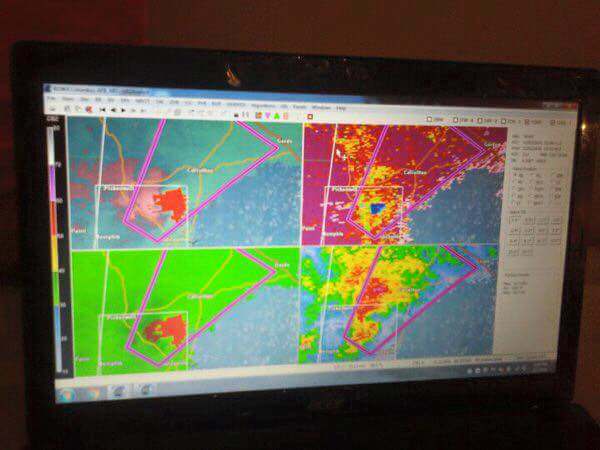 This was co-located with both the velocity couplet (both left side panels) and the highest reflectivity (bottom right). A tornado did touch down from this and was confirmed by spotters -- but it did not remain down and indeed, the follow-up statement was for "radar indicated rotation". A severe storm capsized a Ride the Ducks boat in Branson, MO. 13 confirmed fatalities, 4 people still missing. Not good for a company that already had a very questionable history of safety. The sad part is that there was plenty of warning that bad weather was possible. A severe thunderstorm watch had been in effect for most of the day, and a severe thunderstorm warning was issued at 6:32 pm, 30 minutes before the incident happened. I guessed it would be an EF3 too based on pictures posted to twitter. I saw the aftermath of an EF3 that hit Coal City, IL, a few years ago, and the damage in Marshalltown looked to be the same caliber.